Company located in California dedicated to the production of salsa, chiles, nopalitos and mole, as well as many other specialty Mexican sauces and dips. Manufacturer of food condiments and canned foods, including soy sauce, sauce paste, garlic sauce, and spicy hot sauce. Offers gourmet seafood and meat marinade and a Southern mustard BBQ sauce. Manufacturer of soy sauce since 1645. Soy sauce history, product information, recipes, press releases, and contact details. Manufactures, distributes and sells steak sauce wholesale, retail and direct to consumers. Includes product information, shopping, recipes and nutritional facts. Provides private label hot sauce for companies and restaurants. Corporate web site, products, recipes, cooking tips. Specialist in sauce development and manufacturing for the food service industry. Private label hot sauce producer and exporter from Costa Rica. Processors of sun dried tomatoes available packed in oil and herbs, or in sauce or pesto. Producer of whole peeled tomatoes and tomato sauce. Produces an array of fish and chili sauces. Contact information. Producer a variety of Indian sauces. Product details and recipes offered. Make magic, color, and play games like McNugget Moonbounce and Sauce Splat with all your McDonaldland friends! Producers of branded mustards and worcestershire sauce. Product information, history, recipes, and contact details. Manufactures condiments including mayonnaise, ketchup, mustard, barbecue sauce, oils, and flavored syrups. Producer and exporter of hot and sour chili sauce from fresh chilis. Product details and specifications available. Manufacturer of nutmeg products including liqueur, syrup, pepper sauce, jams and jellies. Southern California manufacturer of mustards, horseradish, worcestershire sauce, vinegars, and gourmet and specialty condiments. Manufacturers of mustard products and horseradish sauce. Company profile, product listing, and contact details. Manufactures oriental condiments including chili, oyster and soy sauce. Company profile, product and recipe information, and contact details. Producers of functional flavor ingredients such as glazes, marinades, rubs, and sauce bases. Product details. Manufacturers of branded worcestershire sauce. Offers company history, product information, seasonal recipes, and contact details. Mushrooms and truffles, oils, pasta and tomato sauce. Includes a list of stores in Italy where the products may be purchased. Manufacturer and distributor of tomato paste, sauce, and other products. Find Italian recipes, company and product information. Offers product and nutritional information, recipes and cooking tips for its wide range of pastas and sauces. Offers red pepper sauce that is legendary among hot sauces. Find spicy food recipes and gift ideas. Tour information available. Provides information on Pelino brand pasta sauces. Producer of soy sauce. Contains product information, corporate profile, and some food ingredient information. Manufacturers of hot cayenne sauce. Company history, product information, recipes, and contact information. Producer of export crops in Belize, Central America. Products include fresh and frozen fruits and vegetables, and Belizian habanero pepper hot sauce. If the business hours of La Victoria Foods in may vary on holidays like Valentine’s Day, Washington’s Birthday, St. Patrick’s Day, Easter, Easter eve and Mother’s day. We display standard opening hours and price ranges in our profile site. We recommend to check out lavictoria.com/ for further information. 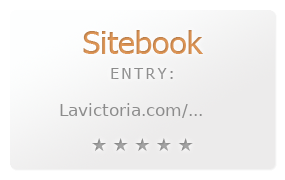 You can also search for Alternatives for lavictoria.com/ on our Review Site Sitebook.org All trademarks are the property of their respective owners. If we should delete this entry, please send us a short E-Mail.